We just can't make up a better line than used by the seller to describe this 1986 Plymouth Caravelle. 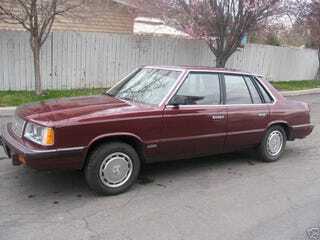 The turbo sedan also features a cassette deck, and enough burgundy velour to make even Ricardo Montalban jealous. Where was this guy in 1986 when Plymouth needed a catchy ad slogan for this fine Chrysler Corporation K platform derivative?